Thousands of messages to God have been cleared out from Jerusalem's Western Wall. Equipped with long sticks, a team of cleaners on Wednesday gouged out written prayers that visitors traditionally cram into its crevices. Twice a year, before the Jewish New Year and ahead of the Passover festival in spring, the Rabbi of the Western Wall oversees the collection of the prayers to make room for more. 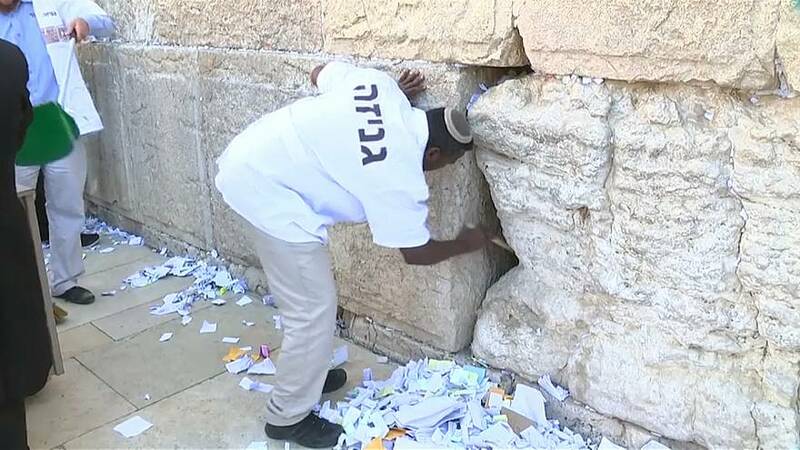 Rabbi Shmuel Rabinovitch, the current occupier of that office, explained: "When a person writes a note and puts it inside the Western Wall, at that moment he expresses his wishes. There is no need to keep it any longer." More than a million notes of prayers or wishes are placed in the Western Wall every year, by visitors and locals, Jews and non-Jews. Online services for those who can't make it to Jersualem allow them to enter their note on a website or by text and have it printed out and taken to the Wall. Visiting dignitaries who have participated in the tradition include several Popes, Donald Trump, Hillary Clinton, and Barack Obama – whose note written in 2008 was stolen from the Wall and sold to an Israeli newspaper, which published the note and drew criticism from Rabbi Rabinovitch among others in doing so. The Rabbi receives hundreds of letters each year addressed to "God, Jerusalem" and he places these letters in the wall too. After they are removed by the cleaners, the notes are then buried on the Mount of Olives, according to ritual. Rabbi Rabinovitch said: "God willing, these notes will be buried and we hope that God will hear the prayers of all those who put their requests here from Israel and abroad, Jews and non-Jews alike." The Western Wall is a remnant of the compound of the Second Temple that was destroyed in 70 AD (CE). It stands today beneath a religious plaza known to Muslims as the Noble Sanctuary and to Jews as the Temple Mount. What percentage of Europeans have 'absolute belief' in God?